Nishi, K. and Hozumi, K.
Hours: Tuesday through Sunday, 10:00am to 5:00pm. Closed Mondays and major national holidays. The Morikami Museum and Gardens is considered the only museum in the United States dedicated to the living culture of Japan. This exceptional cultural site was made possible by George Morikami and is owned and operated by the Palm Beach County Department of Parks and Recreation. At the beginning of the 20th century, Morikami left Miyazu, Japan with a group of fellow emigrants to establish a farming colony called Yamato in Boca Raton, Florida. The community did not survive, but Morikami remained in Florida as a farmer and businessperson. In 1977 he bequeathed 200 acres of land to Palm Beach County and the State of Florida to honor his fellow colonists and both their original and adopted homelands. Today, the Museum includes both permanent and changing exhibitions on Japan and related cultural topics, the Yamato-kan villa, sculptures, bonsai collections, gardens, pavilions, cafe, museum store, the Donald B. Gordon Memorial Library, IBM Infotronic Gallery, annual festivals and nature trails. Performances and film series are held in a 225-seat theatre. Tea ceremonies are held in a dedicated tea house, Seishin-an. The institution also sponsors classes and workshops in origami, bonsai, ikebana, haiku, sumi-e painting, orchid cultivation, Japanese language, photography, kite-making and other topics. Phase One of the garden included the Yamato-kan pavilion, an historic ishidoro stone lantern, a tsukubai (water basin), bonsai display, Allen S. Austin Memorial Waterfall (designed by Carn Reid), a kame shima (turtle island), a Challenger Memorial Lantern, Yamato Island, the Morikami Falls, the Wisdom Ring, a dry creek garden and part of the seven-acre lake. Phase One was completed in December 1999 and opened shortly thereafter. The Yamato-kan, located on Yamato Island, was the original site of the Morikami Museum building but now houses an exhibit on the colony of Japanese farmers for which it is named. It is designed to give visitors a sense of the size and layout of a traditional Japanese farm house. The ishidoro lantern was originally erected in 1681 at Toshogu Shrine in Edo as a memorial to Ietsuna, the fourth Tokugawa shogun. It was later moved to a shipbuilding company in Kure and then later to a ship owner in West Palm Beach. From there it found its way to the South Florida Science Museum and finally to the Morikami in 1977. The Challenger Memorial was dedicated to the seven Challenger astronauts, one of whom was Ellison Onizuka, the first person of Asian descent to travel into space. The Kasuga-style stone lantern is on the northwestern tip of Yamato Island. The Wisdom Ring is located west of the current main museum building. It is a replica of a stone lantern (ishidoro) located in Delray Beach's sister city in Japan, Miyazu, where it is the town symbol. The original Wisdom Ring (chie no wa) stands on the grounds of a temple dedicated to Monju, the Buddhist bodhisattva of wisdom. This replica was given to the Museum by the citizens of Miyazu to commemorate the institution's 20th anniversary in 1997. 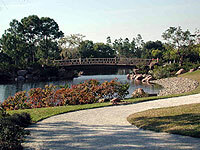 The Morikami Museum and Gardens opened the second phase of its Japanese gardens on January 9, 2001. The six new gardens had been under construction for the previous 18 months and opened with events that included taiko drumming, origami, calligraphy, bonsai, ikebana and tea ceremonies. Officially now known as the George D. and Harriet W. Cornell Gardens, the $3.5 million project covers 16 of the site's 200 acres and is now one of the largest Japanese-inspired gardens in the world.